An invaluable aid to me when I am working on an observing program is an all-sky map showing the distribution of the things I’m trying to find. 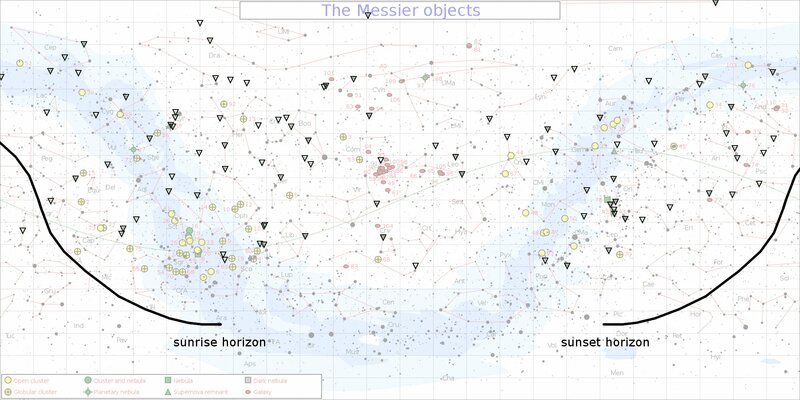 The maps of the Messier objects and Caldwell objects from Wikipedia are my constant companions when observing: I printed them in color on 11×17 paper, folded them in half, and stuffed them in sheet protectors. Only one of the 100 double stars on the AL list is below the horizon at that time. So during Messier Marathon season it should be possible to do a double star marathon as well, and try to split 99 of the 100 AL doubles in one night. A double star marathon would bring interesting opportunities and challenges. 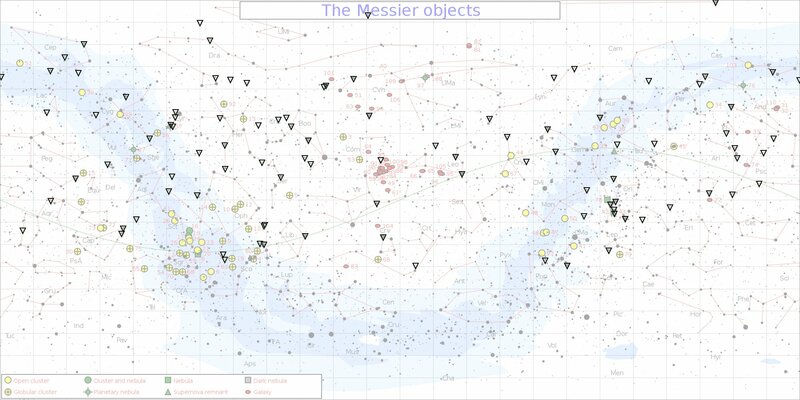 With Messier marathons, the primary enemy is the moon: you have to go within a very few days on either side of the new moon, or the moonlight will drown out some of the fainter objects. But the relatively bright double stars on the AL list would punch through a fair amount of moonlight. You still wouldn’t want to go between first quarter and last quarter, probably, or the moonlight would wash out some of the guide stars you’d need to find your way, but the window of opportunity should open from six or seven days around new moon to about two weeks. On the flip side, in a Messier marathon the seeing isn’t that crucial because you’re observing big, extended objects, and just trying to log them, not necessarily tease out details. But to split some of the tighter double stars requires reasonably good seeing, and there’s no way to predict that in advance, sometimes not even from early evening to midnight or midnight to dawn. So the Messier marathon has a tighter constraint from the moon, but it’s predictable, whereas the one sky condition that could make or break a double star marathon (at least for a crucial few of the tightest doubles) can’t be predicted in advance. I first raised the possibility of a double star marathon a couple of years ago on Cloudy Nights. As far as I know, no one has attempted one. I haven’t, for a couple of reasons. First, if I get to a dark site at Messier marathon time and can afford to stay up all night, I’m going to run a Messier marathon. Second, it’s precisely because double stars punch through light pollution so well that I tend to save them for observing from home–no need to waste my dark sky time on something I can see from my driveway, and my driveway does not have good enough horizons to attempt a marathon of any kind. But I suppose I could head up to the top of the local parking garage and try a double star marathon from there. It wouldn’t require a long drive to dark skies, just a free night followed by a day with few responsibilities. If I ever get around to it, I’ll let you know. Related: my free logbook for the AL Double Star Club is on this page, and I have a bunch of Messier Marathon tools here. You are currently browsing the 10 Minute Astronomy blog archives for the day Monday, February 20th, 2012.